On the left is the rug that my good rughooking friend Sue Hammond, of New London, NH, designed and hooked. As soon as I saw her design, I loved it. It’s not a hit or miss rug, but the multi-color leaves, and the birds perched on the tree dazzled me. And so I asked if she would draw out the same design for me. It’s not every rug designer that would agree to a request to copy out a rug they have just started making. So I felt completely honored that she agreed to draw out the same design onto linen for me to make. My version is on the right. The designs are slightly different – she did not trace this design, she just re-drew it for me from scratch. She made the birds on “my” version slightly bigger, and placed one bird right at the center top of the tree. In the version she drew for me, the tree is slightly larger, and I made a few of the branches a bit thicker. And while she really liked her leaves to be not actually touching the branches, I hooked my leaves to be touching their branches. Sue is one of the founders of the Green Mountain Rughooking Guild, and one of its past presidents. She is the emotional anchor of our local Tuesday Morning Rug Group. So I mean it when I say it was an honor to do a version of her rug. And we both took great pleasure in seeing each of our rugs take shape, week to week – hers with her light background, mine with its dark background. We both edited the colors of the wool we chose for the leaves against our backgrounds – her leaves could not be too light, mine could not be too dark. Yesterday, for the first time, we looked at both rugs, finished, side by side. 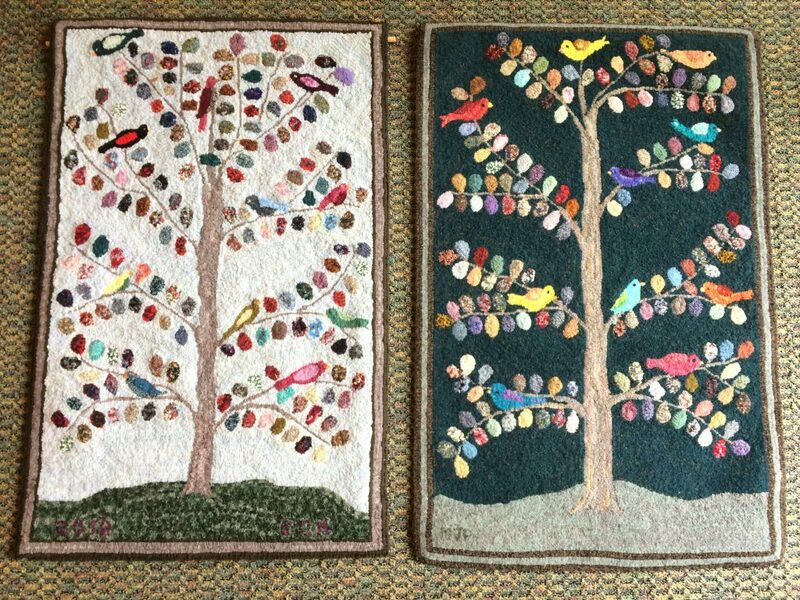 I will be putting my rug into the Green Mountain Guild’s next Hooked In The Mountains show, and the title of my rug will be Sue’s Tree of Life. Sue’s design is lovely and you both did a wonderful job! Wonderful! And very true words about Sue! I love seeing the same design side by side we all have our own ideas of what it should look like. But are so wonderful and whimsical. Fun rugs. Will Sue’s rug also be in the show? Not sure, will check on that! Oh this is lovely! I love your dark background and multicolored leaves. SO very sweet! Jo Meginnes on A little experiment… in looking. cathy Dupuis on Happy Thanksgiving!